This year’s Junior division featured 6 squads of young men looking to put their stamp on the 28th Annual NACBAIT. Although most teams were in a rebuilding phase this year, you wouldn’t know it by watching the games, as these youngsters left it all on the court. In the quarterfinals, the Toronto CCYAA 18’s faced the Washington CYC 18’s. Toronto was definitely looking to retool this year, after their backcourt studs of the past few years moved up into the Men’s competitions. This year’s Toronto team relied more on size and big bodies. CYC meanwhile, was strong at the guard position and may have had the best “veteran” backcourt in the Tournament. The CYC ballhandlers kept them in the game in the first half, as Scottie Hsieh (8 pts) calmly swished 2 sweet treys and repeat All-NACBAIT PG Jason Lee distributed the ball well. But in the second half, Toronto’s huge size advantage, deeper roster, and rebounding margin put the game out of reach. Toronto ended up winning comfortably 40-22. Larry Ma registered 7 for CCYAA, while teammates Jeremy Sin and David Quach each scored 6. The second Quarterfinal was a rematch of this year’s Pre-NACBAIT Classic Finals, with the NY ISS Flights 18 and the Phila Suns 18’s meeting up once again. Following a couple years of being tortured by the deeper and more finely tuned Suns of the past few seasons, it was time for the Flights to teach the few remaining holdovers from the Philly team a lesson at the big tourney. NY obviously had a better bench easily going at least 10 deep, while Philly relied on basically 5 guys the whole weekend. NY exploited that weakness by taking it right to the Suns and daring them to step up to the challenge. By the time the end of the game, 2 Suns fouled out and another was saddled with 4 personals. The other Suns didn’t even bother to play defense. The Flights had an easy time of it, and walked all over Philly on the way to the Semis 34-21. Forward Peter Nguyen had 9 points and 3 steals for NY, while De Lin (7 pts, 3-7 FT, 7 rebounds) was the top player for the Suns. In the Semis, the first game was the NY USAB 18’s and the Toronto CCYAA 18’s. This game has been the Championship game for the past 3 years, so seeing them in the Semis was something new. The game started off well for both teams and it was anyone’s for the taking. David Quach (All-Tournament, 10 pts, 6-11 ft) and Mark Hsu (9 pts, 1 trey, 4 rebounds) were putting the points on the board for Toronto, while last year’s MVP swingman Menley Khuu (18 pts, 3 trifectas) and newly discovered PG Joe Chin (10 pts, 5-10 ft) were the keys for USAB. At the half, Toronto trailed by 3, 22-19. In the second half, NY USAB managed to pull away and CCYAA was forced to foul. Despite shooting only 6 of 15 from the line, USAB maintained their lead. After Toronto was called for 2 technicals to lose any hope of a momentum turn. USAB took it 39-27. Immediately following, it was 2 more NYC teams sizing each other up for their shot at the Championship. When the undefeated NY Young Life Rockits met the 2-1 NY ISS Flights, everyone knew this was going to be a loud and boisterous affair. Peter Nguyen put the Flights on his back early to give the Flights an early advantage. On defense, George Tang and William Hu were the ISS crucial parts, as they held the Rockits to an unsightly 4 points and only 1 field goal in the half. The halftime score was only 11-4 but the Flights seemed to be comfortable with the status quo. But then the second half came, and it was a whole new ballgame for the Bizarro World Rockits. Eddie Zheng (9 pts, 2 swats), Dennis Liew (4 points, 2 rebounds), and Jimmy Lau (6 pts, 2-2 FT) came to life after the break and the Rockits were back in business. The Flights couldn’t seal the deal when they needed to. As the tide shifted, the Rockits were able to take the lead and hold on for a 24-21 win.The Championship Game was expected to be a big time showdown between NY USAB and the NY Young Life Rockits. But the hype never materialized. USAB has been here many times before and knew what to expect. Meanwhile, the Rockits looked tentative and intimidated by what lay before them. 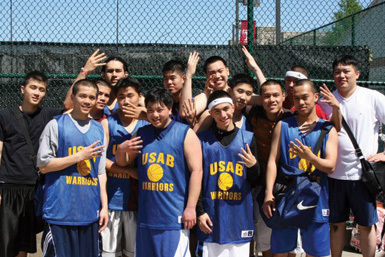 USAB began by trapping the Rockits guards early and often. The resulting turnovers allowed them to take a 23-10 lead at the midpoint. The second half was more of the same before USAB emptied the bench and won yet another Title 57-33. The Rockits were paced by Jimmy Lau’s 8 points, while USAB’s top performers were Menley Khuu (repeat MVP, 20 pts, 3 treys, 4-6 ft) and Joe Chin (All-Tournament, 14 pts, 9-10 ft). Congratulations to the NY USAB 18’s and Coach Bill Chan on capturing a record 4th straight Junior National Championship.